Looking to adorn yourself in jewelry with a little edge? 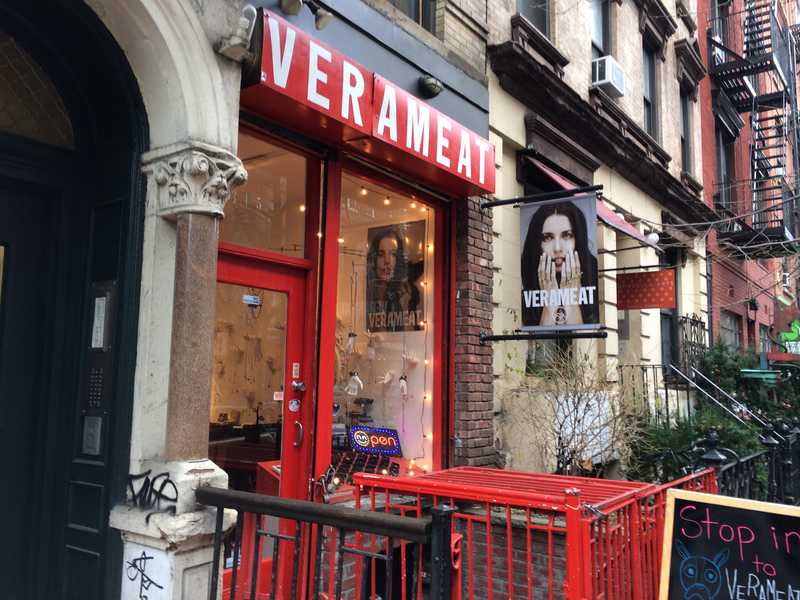 If Tiffany's is a bit too precious for your darker sensibilities, make your way over to Verameat in the East Village where you can find artful jewelry for the urban girl. Verameat is the brainchild of Ukrainian model Vera Balyura, who took her jewelry making past-time and turned it into a full time gig. Balyura's style can best be described as beautifully disturbed. Her pieces are distinctly creepy in feel, with much of the collection featuring oddities such as monster teeth (vampire of course), human brains, T-rex eating chicken, skewered steak (yep, the meat), and even the 'hand of god'. Weird, yes, but still strikingly beautiful too. Each piece at Verameat is crafted from recycled gold, silver, and bronze, and despite the playful themes, the jewelry itself is delicate and masterfully crafted with lovely sculptural detail. Our favorite pieces are the Verameat spine bracelet and spine ring, which look as though you've wrapped an ancient fossil around your wrist and finger. If wearing a spine seems a bit morbid to you (can't imagine why) check out the Vermeat French bulldog ring which is hella cute AND 20% of the proceeds go to the Barc Shelter in Williamsburg! Don't you just love getting something shiny while helping out a really good cause?